For five years Martina Laird was part of a Saturday night institution. In Casualty, the actress won our hearts as steely paramedic, Comfort Jones; a role she is immensely proud of. Since leaving the show in 2006, Laird has worked extensively in television and on stage, performing in Shakespeare dramas and ITV soaps. 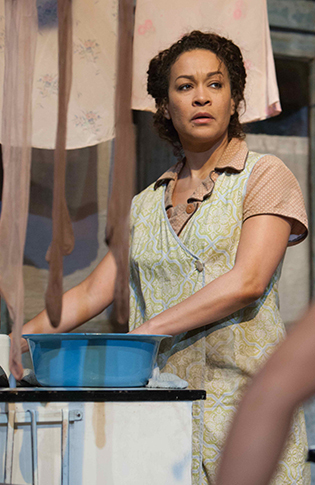 Having appeared as Sophia Adams in the National’s 2012 production of Moon on a Rainbow Shawl, Laird is preparing to reprise her role in a UK tour produced by Talawa Theatre. The part time drama teacher is incredibly friendly and so passionate about her work that she frequently apologises for rambling! What makes this role so poignant is that Laird is herself from Trinidad and I am curious to know how that manifests in this Trinidad based play. Also, what makes a role so special that an actress very much in demand would take it up a second time? 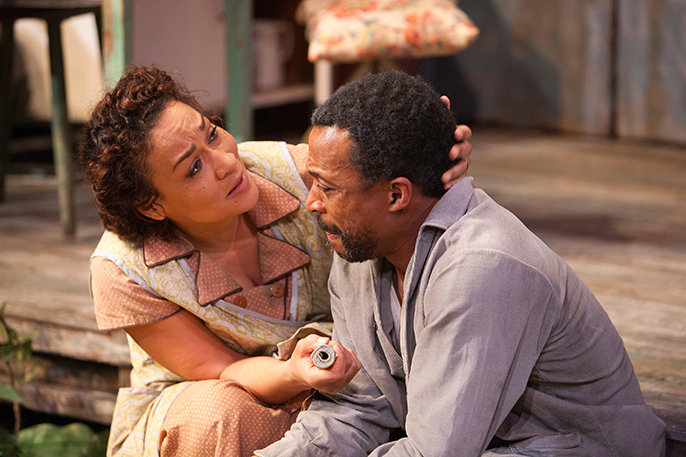 How do you feel about reprising your role in Errol John’s play? I’m enjoying it. It’s the first time I’ve done that and so I was a bit worried not knowing what to expect. Also it’s a hard role, a lovely role that takes everything out of you. But what’s great for us as a cast is that there are several new cast members in important parts so they bring their new elements to it. Now we can try to penetrate even further into the text, which is exciting. How have the new cast members changed your role? It’s interesting; inevitably you bring your own experience and your own rhythms and energy to whatever part you’re playing and as an actor you’re playing opposite something new and so you’re responding with a different part of your character. Even though it’s the same text and same characters you are finding different ways of interacting. Michael (Buffong-director) has been wonderful in allowing new people to bring their own choices and not recreate something someone else did, so new choices are being made and you have to respond to it as truthfully as you can. Your character Sophia is desperate to rebuild post war Trinidad. As you’re from Trinidad yourself, how does your own migration affect you and your role? That’s one of the things I love about Sophia Adams; how passionate she is about her country and its future. It’s a real question that every generation of Trinidad has to face because there’s always that migration issue. My thing for me is that I’ve only ever been an adult in this country; I was a teenager when I left, so it’s still my home and my identity and who I am. But I feel rooted here and also here is where most of my work is. But there is still a longing to be part of something that one grew up in, and to work there and have artistic interaction with fellow actors from Trinidad. The closest I got was last year; I was in a production called O Starry Starry Night by Derek Walcott and there was a company of mainly Trinidadian actors and that was perfect because we were able to capture a much broader perspective. The play was about the relationship between Van Gogh and Gaugin, and playing it to a European audience as a company of Trinidadian actors we were able to say ‘These characters mean something to us as well’ so we were able to find ourselves within that expression. It’s that continual question of crossing backwards and forwards culturally. Moon on a Rainbow Shawl has such humanity in it. It’s about the human need to break free even at the expense of the love we leave behind us. It’s something that I think we all have to question ourselves about as we grow. What doing something in a West Indian location does is it frees you to just express humanity in a broader sense. What often happens in this country is that as a black actor you always have to be dealing with race. That is not our everyday lives and that’s what I love about what Talawa’s doing. Talawa has just done a production of All My Sons and people questioned what place Miller has in the black experience, and of course there’s a place for all of that. In fact, here’s a bit of a story; whilst I was in St Lucia rehearsing with Derek Walcott I found out that Arthur Miller had visited Walcott many years before. A group of actors came over from Trinidad and performed Arthur Miller’s work for Arthur Miller in St Lucia and he loved it. It’s sanctioned by the author who can see that human tales need to be told by everyone. What is the current situation in Trinidad economically? Trinidad is a wonderful little microcosm of the rest if the world in the sense that what is happening everywhere is that the polarity is growing between factions of society. There is a faction of Trinidad that is operating on an international level of financial affluence and then there’s the rest of Trinidad who are still working on the range of local income, cost of living and standard of living. It’s happening everywhere and of course it breeds unhappiness and inequality and the results of that can be quite terrible. Hopefully there will be some way of redressing that balance. Trinidad has a long history of political expression through its culture; through its calypso, through its carnival. These art forms which are being distracted by the “part party” atmosphere but hopefully there is that root there that is still very real and will produce something that takes its people forward. You’re probably best known for playing Comfort Jones in Casualty. How was your experience at the BBC? It was great. I was lucky I was in Casualty at a time when we “BMEs”, or whatever they call us were well represented. Also I was working opposite Kwame Kwei Armah and we were playing partners, and at that time I believe we were the only black on black couple on British television. So we represented that and were a part of that. To be a successful couple with couple’s problems; that was something we were both proud of. Why did you decide to leave Casualty? It’s hard to explain to people. I loved the job. I was there just over five years and I did some great storylines including some amazing stunts; jumping out of moving vehicles and what have you. It was brilliant but as an actor you grown restless and you want to try something else. You see an amazing production at the theatre and you go ‘Oh I want to do that as well!’ so now I’ve done a lot of theatre, I’ve been at the Donmar and the National and it’s been great, so now I’m going ‘Oh, I wanna go on television again!’ (Laughs.) Typical; the grass is always greener. What drives you to act? Ok, I’m a bit of a nerd, so I’ll probably be boring. But for me there is a search for truth within the recreation of life and it’s a safe place in which we enact that which we try to stifle in everyday life. To live at that pitch would be dangerous and so in acting on stage, in television, film, you get to reach for the extreme experience of what it is to be human - to understand and to share that. Outside of your career what else do you pursue? I’m proud of what Talawa is doing. When I first started out there were a number of black companies; there was Temba, Double Edge and many more. Now Talawa is one of the few remaining and they are reaching for standards that share something important with their audiences as well as their artists. Well I’m quite single minded and so the other thing that I’m passionate about is my teaching. I’m very lucky; I get to teach acting students and you do fall in love with them and get attached to them and their career outcomes. So that I’m lucky to have found that because in between acting there is something that still elevates you. I teach BA level, and I also teach some teenagers from 16 and up. The two main places I teach at are Weekend Arts College and ArtsEd. I feel blessed because I’ve gotten to work in places that I respect and respect what they stand for. Both of those places are very sound and reflect who I am as a teacher. In Talawa as well I’m proud of what it is that they’re doing here. When I first started out in the business there were a number of black companies; there was Temba, Double Edge and many more. Now Talawa is one of the few remaining and they are reaching for standards that share something important with their audiences as well as their artists. Why should people come and see Moon on a Rainbow Shawl? This play has such humanity in it. This play is about the human need to break free even at the expense of the love we leave behind us. It’s something that I think we all have to question ourselves about as we grow. It’s taken from that personal place and can be appreciated in the context of vast historical significance as well. So we see how that relationship grows. It’s a warm tale, it’s moving but also it’s superlative writing; it’s a refound classic. What I love and am excited by is that we can try to do the best work we can and through that establish a cannon of classical black writing.